What It Treats – Provides temporary relief for Marine Velvet Disease. After a 30 minute H2O2 bath, the fish should be transferred into a Quarantine Tank (QT) and treated with either copper or Chloroquine phosphate. 1. Prepare saltwater for the bath by having it set to the right temperature and heavily aerating it. You can accomplish the latter by running an airstone or pointing a powerhead towards the surface of the water for at least 1 hour (longer is better). 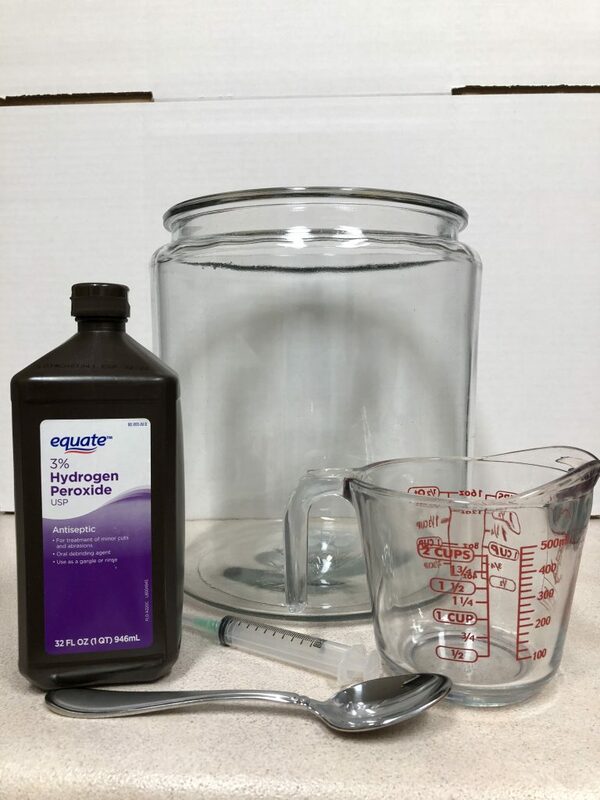 Alternatively, you can use Display Tank (DT) water or even from your Quarantine Tank (QT) provided no medications/chemicals are present in the water. 2. Add saltwater (using measuring cup) to the large glass bowl. Keep track of exactly how much water is added - either in cups or ml. (Do this beforehand if preparing saltwater for the bath right in the glass bowl.) Make sure your fish has enough water to swim around and last for 30 minutes without aeration. 3. Discontinue all aeration before adding Hydrogen Peroxide to the water. Using a syringe or pipette, add 3% Hydrogen Peroxide as per dosing instructions below. Dip the tip below the waterline and spread the H2O2 throughout the water. (Do not allow any air/bubbles to enter the water at this point.) After dosing is complete, gently stir the water using a metal spoon. The reason you want to be careful not to create any gas exchange/aeration once the H2O2 has been added is to prevent the atoms from releasing their bond and becoming just oxygen + water. 1.25 ml of 3% H2O2 per 2 cups of saltwater. It's okay to overdose slightly. 2.5 ml of 3% H2O2 per 1 liter of saltwater. It's okay to overdose slightly. Cons/Side Effects – Still experimental so side effects are not really known. It's possible some fish may not tolerate this treatment.